My first favorite find was this Victorian era black transferware pot lid and base. Next, Paula and I spent a long while in the booth of a lovely French woman who had wonderful things...I bought this tiny blue enamel mold (the tiny tin rabbit mold was already mine). She had other tiny blue enamel pieces and I wish now that I had purchased them all. ...don't you just love that sweet little blue dish? From the same French vendor, I bought the old glass yogurt jar on the left and the two tiny antique cupping jars on the right. ... I can use them as itty bitty cloches! ...I just liked the look of them! ...before I close it up tight! OK, that was fun....at least for me! ...what would you put in them? ...and a few pictures from Paula's gorgeous gardens and home! Have a good night and a great Tuesday! Oh Laura, you have scored some amazing finds!! Looking forward to pics of Paula's home. I always love seeing your flea market treasures. You have a great eye, and your photographs are always terrific too. Have fun playing with everything. I'm thinking they look good no matter what is in them!! What great old jars. Too bad you didn't find more because I love every single idea of things to put inside them. Have fun with those beauties! I love the buttons and lace...but they are great and anything will be lovely! Love, love, love the cupping jars and oh my gosh the french canning jars is wonderful!! Love them filled with the white buttons! What great finds! I love the blue enamel and the old canning jars are great. I'd put buttons in them - black in one and white/cream in the other. I just love the look of buttons in glass jars! Thank you for sharing your wonderful finds! I love your finds Laura! Those jars are amazing and those medals! I would love to go to Brimfield one day...I'll have to ask you for some tips before I go! I love the cinnamon sticks and I also love the buttons and lace. Its amazing how easy it is to transform a jar with adding different pieces. Love your blog by the way. Keeps me inspired. LOVE your finds and the jars with buttons and lace are really yummy! Your posts on Brimfield have been real inspiration! Laura~ great finds! I especially love the old jars and the cupping jars...and of course the transferware...wow! Great finds! Love the enamel dish and the glass canning jars are awesome! I have to say transferware is my absolute favorite and I just love the lid you found. EVERYTHING looks great in those jars. What a find! And the little blue dish - sweet. Wonderful finds. I love those jars with the rusty lid and those tiny cloches too. these two jars are amazing and I love your jar fashion show!I can see you have fun! Et tes bocaux tu peux mettre n'importe quoi dedans ils seront magnifiques. I think you have a future in "jar fashioning" :-) Seriously, they all look lovely and all your Brimfield treats make me want to go to Brimfield even more! What great finds! I love the old canning jars. The rusty tops make them better. Love the badges:) Beautiful with the buttons, crusty, rusty and gorgeous! Have a blessed day my friend! Oh how much fun to play with filling those jars! It was the best fashion show I have ever been too. I would love to see how they look with the old dominoes or even some old jewelry. I hope you will continue to enjoy all your treasures for many years!! 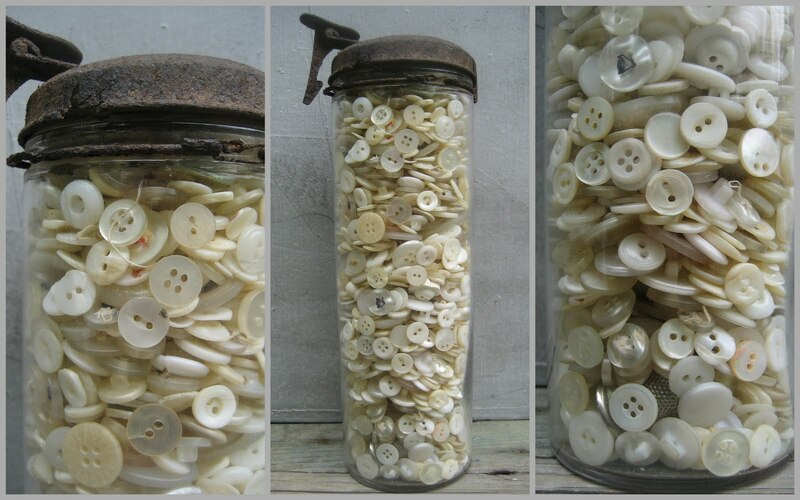 Love the jars filled with buttons and lace,,,but of course those are two of my favorite things! I just don't know what could be more fun than what you just had! Well, maybe bringing all the stuff home and playing with it! And....of course....the anticipation of the next HUNT! Looks great.It certainly will be difficult to settle on an idea for "jar filling".They all look wonderful.I am partial to buttons and lace as I've recently been filling my own jar finds with the same notions.Enjoy. I can't get enough of jars and love to fill them...so beautiful! I love the Anchovy Paste lid. Do you know, I often find pieces of those lids in our garden when I'm digging. ... and all sorts of other things! Ciao Lucky Laura! What a faboulous victorian transferware you found!!! It's a beauty...and I like anchovies too!!!! The jars are gorgeous...I love the rusty look and you filled them in such nice ways!!! They're very decorative!!! Finally a sunny and warm day! Perfect to be spent outside...unfortunately I've to work, but I have a nice and sunny view from my office!!! I love the tall jars, and, even more I think, what you have filled them with! Great finds! I especially love the glass jars. My favorite 'filling' is either the buttons or the sea glass, though everything you tried out looks great! Wow Laura what a beautiful things you found !!! Fun ideas for the jars, what are those white things, nuts? If you don't want to open them again, I'd say "no" to the buttons and lace because I'd have to get into those, ha ha! The sun has come out and I'm filled with joy so off for a run to get some energy out. Love to you!! Love all of your finds Laura! They are so different! The jars look great! Laura, You did get some great finds! Love the transferware jar and the 2 tall glass jars. Everything looks wonderful in these but I think I am partial to the buttons and lace. (((sigh))) Brimfield! What a lucky lady you are to have been! And your finds are just FABULOUS! I have to admit, the anchovy paste jar is my favorite... hubby and I collect them! Love all your glassware too, especially the yogurt jars. Love how the buttons and the lace looks in the vintage jars! Love love love all of your fun, beautiful finds!! And your gorgeous photos of them! !